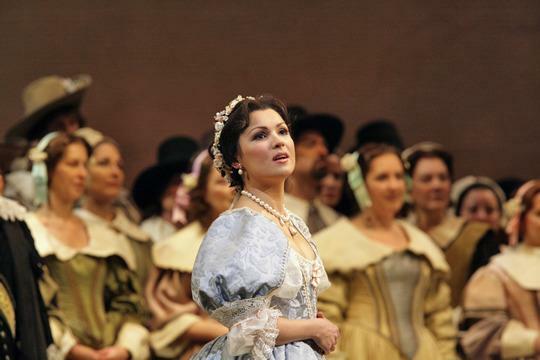 Perhaps the best news about this new DVD of I puritani from The Metropolitan Opera in New York is the picture quality. Thanks to the introduction of the 'HD Live' cinema broadcasts, all future recordings from the house promise to be filmed in high definition, which means an end to the gravelly pictures one used to encounter in operas from the Met (for instance in the recently-released Pavarotti Ernani). Otherwise, the combination of an acceptable but largely unremarkable supporting cast and an old-fashioned production make this a rather ordinary and sometimes boring experience, contrary to a number of rave reviews I read around the time of the performance (6 January 2007). Bellini's final opera is one of the most beautifully written of the first half of the nineteenth century. But the bizarre story, which is set 'in a fort near Plymouth at the time of the Civil War in the mid-seventeenth century' and involves a heroine who is mad all the way through the opera until she miraculously recovers due to the love of the typically bland tenor character, Arturo, not to mention a historically ridiculous amnesty from Oliver Cromwell, leaves much to be desired. There are some glorious set pieces, with mad scenes galore, but the opera needs to be staged with a lot more conviction than it is here at the Met if it's to engage the viewer. Sandro Sequi's production resembles a concert performance at times, because there's so little action; it doesn't help that Ming Cho Lee's sets (first seen in 1976 - when Sutherland, Pavarotti, Milnes and Morris were in the cast) are rather two-dimensional. And gorgeous though Peter J. Hall's costumes are, their lavishness often hampers the singers' movements (and would the Puritans really be dressed in such fine cloth?). All of this runs against the basically neurotic character of an opera like I puritani, which needs energy to be thrown at it if it's to convince in the theatre. Amusingly, the cameramen seem to try to make up for the general inertia of proceedings by moving the camera in circles around singers who aren't moving, for instance in the second-act duet between Giorgio and Riccardo. Thank goodness then for Anna Netrebko, who tries single-handedly to inject life into these dull proceedings and often succeeds. Her Elvira is not perfectly sung by any means - just occasionally her intonation goes a little sharp and she fudges many of the devilishly tricky coloratura passages - but much of what she does is sublimely beautiful and she is by far the outstanding member of the cast. I cannot help but admire her efforts to bring the drama to life, for instance by singing the second stanza of 'Qui la voce' in Part Two lying flat on her back on the stage floor with her hair dangling into the orchestra pit, and the film is certainly worth viewing to experience her performance. Nevertheless, when Netrebko isn't on, the opera seems rather dull. Eric Cutler makes a valiant attempt at the role of Arturo, which is as technically challenging a role as one will find for a tenor in this repertoire, and his singing is never inadequate. But he had been suffering from a cold not long before this performance and sounds just a little nasal during some of the lyrical passages; it's also difficult to believe in his passion for Elvira when his face and body are so static. Similarly, John Relyea isn't captured at his best here as Giorgio, sounding rather tired and scarcely moving a muscle at times; though sung with a full tone, Franco Vassallo's Riccardo seems little more than adequate to me. The basic problem is that none of the singers, save Netrebko, realises that this repertoire is as much about drama and psychological motivation as it is about singing well. Patrick Summers creates some interesting timbres in the orchestra, which plays splendidly during the Storm, for instance, but at times it would have been more effective to move the singers on rather than indulge them with slightly slow tempi. It's good to see a few bonus features on this double DVD set. A conversation between the late Beverly Sills and radio host Margaret Juntwait is the best part of the whole thing; Sills describes Elvira as 'a loony lady who sings loony tunes', just one of a hundred amusing yet insightful comments she makes about the opera from the point of view of someone who has been in it. But although Renée Fleming makes a charming guest interviewer and I remain a fan of hers, I'm afraid she doesn't manage to get anything of any interest from Netrebko in a fairly tedious and often banal interval interview feature. 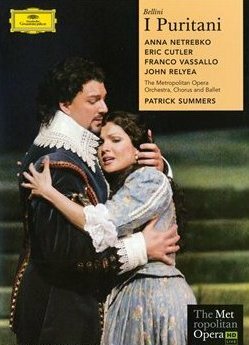 Netrebko enthusiasts need not hesitate to buy this DVD, and it's certainly a fairly reliable count of the score. But the lack of drama will probably deter the general viewer.